My Little Miss Fussy is in love with word search puzzles, she loves writing and reading, making up new words and playing with words in general. Today she started making up a word search puzzle for me, then one for Mr. Bingles and then I decided I was going to make up one for her. 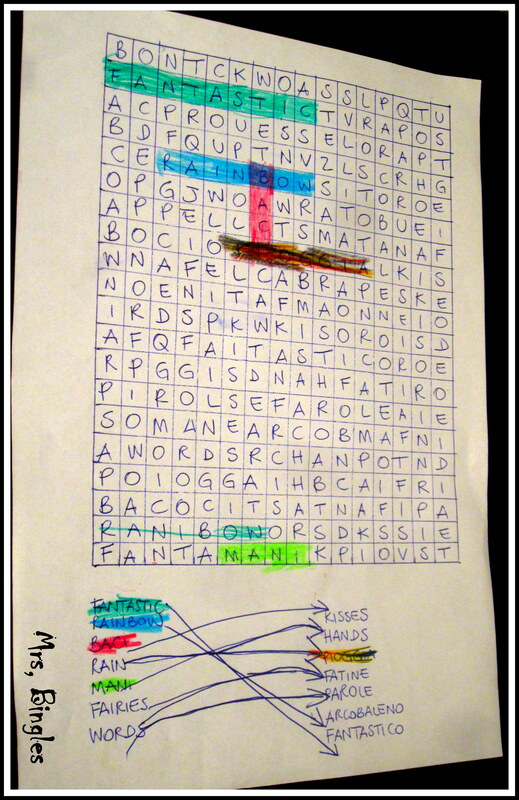 So what I did was writing a word search puzzle on a A4 paper, I included the words she likes at the moment and wrote them in both languages at the bottom of the page. I asked her to have a look at the words, she read them out loud and linked the Italian to the English words, then she started looking up for the words. The other day I was on a train with my girls, chatting in Italian, playing games like “I spy with my little eye something beginning with…” and I noticed the guy in sitting in front of us stopped reading the newspaper (strangely enough he wasn’t reading from an iPad or using a smart phone) and started listening to us. At first I thought we were a bit noisy and I tried to turn our volume down; then I noticed he was smiling when we said something funny and I started thinking he was probably understanding what we were saying. After a little while he looked at me and said he was pleased he could still remember some Italian he learnt a school a few years ago. We had some small talk and just before he left the train he suggested me a book called “They’re a weird mob” adding “you might like it”. I was positively surprised by this unexpected meeting and once at home I searched the web to find info about the book this stranger suggested me. 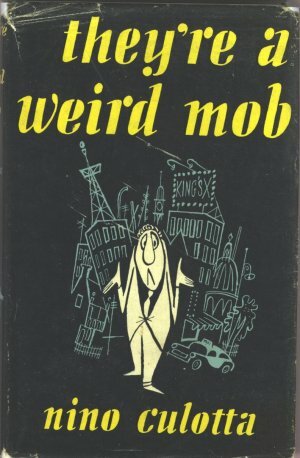 I found out that it’s from the ’50 by an Australian author who pretended to be Italian and published his book under an Italian pseudonym; it was a big hit at the time, loved both by Australian and Italian immigrants. I went to the library and found a copy. Now I can’t wait to have 5 minutes peace without kids around to start reading it. 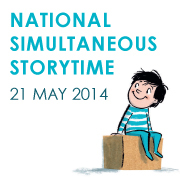 In less than a week time there’s going to be the NSS day. It’s going to be my first one in Australia and I’m a bit excited, probably more than my kids. It’s difficult to imagine the whole Australia reading the same book at the same day and time. I think it’s a great event.